Deco Lam® is designed to do what no other product has been able to do... match the face frames of cabinet boxes to the cabinet doors themselves. Made with the same Rigid Thermo Foil (RTF) material as Deco-Form® doors and accessories, Deco Lam® is bonded to a durable layer of phenolic backing for use in cabinet refacing. Giving every cabinet and face frame the exact same color, grain pattern, and texture, each Deco Lam® match is 100%... a perfect match. 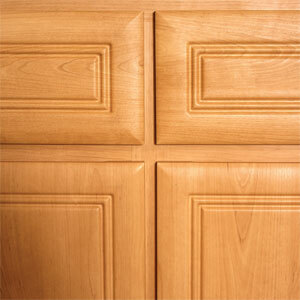 When using Deco Lam® along with Decore-ative Specialties’ wide selection of Deco-Form® (RTF) doors, moldings, toe kicks, base boards, and accessories there is no limit to what you can achieve with cabinet refacing. What are the benefits of Deco Lam®? Eliminate matching issues. Deco Lam® provides your customer with the perfect match for all doors, drawer fronts, face frames, moldings, and accessories since all items are made with the same RTF. Available in 26 colors, Deco Lam® offers a wide range from solids to many different woodgrains. Full Sheet or Custom Widths, You decide! Deco Lam® is available in full 48” x 96” sheets or custom strips from 2” to 46” wide. Deco Lam® is priced slightly higher than the high-pressure laminate you purchase today. Deco Lam® is installed in nearly the same manner as high-pressure laminate with only slight modifications. We will provide you with the information you need to make trouble free installation. Who can benefit from Deco Lam®? Refacers, Closet Manufacturers, Custom Cabinetmakers, Homeowners, and You!